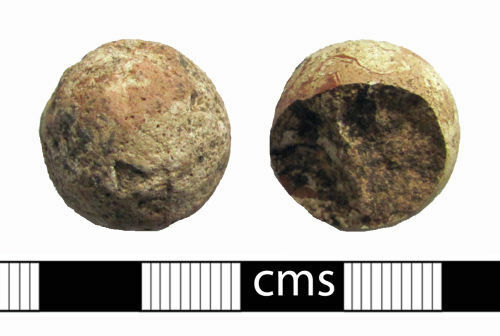 Two fired clay spherical balls, possibly gaming pieces, counters or shots. The fabric is an off-white and has pink to dark red swirls within and few fine iron inclusions. The fabric is reminiscent of some Roman Oxfordshire ceramics, such as Parchment Ware, but there is no evidence to suggest that these objects date to the Roman period and in reality they could date up to the Post-medieval period. One of the objects is complete while about a third of the other survives.